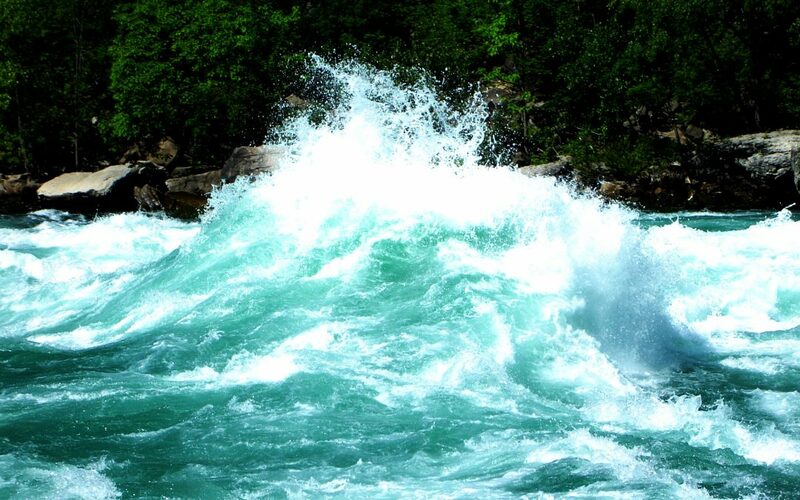 The sudden chaos of rushing white water was overwhelming as I fought to get out from under the huge raft from which I was unexpectedly tossed. I was comfortable with water, but this was not water like I had ever known. This was severe danger. I didn’t know where my raft mate was, I could see nothing under the ferocious turbulent water nor could I gain any control to find air. In a panic to gain control to save myself, I flailed my arms and legs erratically to get out from under the raft and not drown. This raft, once a comfortable ride had now become a huge obstacle and was blocking me from reaching the vital surface. But the more I fought, the less control I had. As fought and flailed wildly, I was being pushed further down under the unyielding raft. Confusion, fear and sheer exhaustion took over. Out of the natural demand to survive, I instinctively asked with all my might and heart to God to allow me at least one breath. I thought if I could get at least one breath, I could live through this overwhelming experience. I do not know how, but my face miraculously made it around the underside of the raft. With my nose scarcely above the wild and incalculable surface, the water seemed to obey a divine command and lowered to just barely under the crest of my bottom lip. With this miracle, I was able to get one precious, quick gulp of air. It seemed like a nano second, but I secured the single life saving breath for which I was desperately in plead. With that breath of air in my once burning lungs, I remembered in a safety training what to do when plunged into a dangerous and life threatening river like this. I crossed my arms, stretched my legs forward with the current, flexed my feet, and lied back. In trust of this advice, I closed my eyes and decided to stay calm. With this one single gulp of air, I surrendered and let go and allowed the intense power of the water to take my body down the river. I had never known that kind of intensity. I had a new respect for the seemingly callous forces of nature. My body was jetted forward in high speed like a luge athlete shooting down an ice track. I can not say how fast I was traveling, however it was an enormously relentless ride. My body, not by my doing, automatically avoided rocks, branches and other rafts. It was as if my body and unseen forces were in perfect sync. The material and the non-material working in harmony as I let go and surrendered. My vulnerability became my safety and my strength. With my one breath being enough and then allowing the wisdom of those who knew how to handle this danger guide me, I trusted. Now like them, I also knew. With as much warning as when the torrent of water started, the menacing threat subsided and I was effortlessly and mercifully popped up to the safety of the surface- as if it were the grand plan all along. The danger was completely over. First surprise, then relief and finally gratitude swept over me. I was safe. I was alive. I was very alive. It is in the surrender and in letting go that we find the relief to our problems in life. It is in the resistance to what the Universe is so powerfully trying to show us and take us towards that we create the pain. Trying to maintain control is an illusion. The only real control comes through trusting and letting go. If you are are having something as powerful and terrifying as a torrential river drowning you under a raft and you feel it is too much- ASK. Ask your personal Higher Power for that breath to take you through. Just one life saving breath, then let go. Trust in the process. Know your Life’s Purpose is unfolding. You will never be given more than you can handle. It is just up to us how long we want it to go on. Surrendering to the process, letting go of the fight, and gleaning from a trusted mentor- you will ALWAYS come out the other side. You will be popped up out of the rushing river one day. Increased wisdom and peace will be your reward. This story is a true story as relayed by one of my private clients. She was on a vacation several years ago with her family and had this terrifying experience while river rafting. For the last few months and after years of searching, she is finally healing from a past great difficulty. In her healing process, she has had both moments of greater peace than she has ever experienced, but still moments of fear would creep in. I would teach her how to let go and surrender. She would try and was doing better all the time, but some days she would find herself fighting the process with great pain and suffering as the result. she suddenly got a clear understanding in her mind. This new understanding was enough. She knew she could now let go and surrender to the process. She then remembered that story from her river rafting trip from a few years ago. She saw herself fighting under the raft, becoming exhausted and in fear. She remembered that one breath she received when she asked her Higher Power. She remembered learning the instruction from an experienced mentor of how to handle this sort of emergency to lay back, cross her arms, flex her feet and not flail and fight. She remembered how she felt watched over while avoiding the rocks and branches and eventually popped up out of the water after the water subsided. Safe, grateful and very alive. That day, she got her one breath in a personal discovery in the form of a sudden understanding. Now with that breath, she knows she has what she needs to surrender and continue to heal with out fighting. It is enough. I personally am always in a new process of surrender and letting go. I conquer one level of a lesson for then another deeper level to appear. I know that in order to ultimately live Life’s Purpose, it is what is required. Each morning , I intend surrender. It is not something one can do in a step by step process. It is experiential and unique to each person. But through the intention, the way is eventually found. Are we fighting under the raft or are we remembering to ask Source for a breath and then surrendering down the river with our arms folded? If you are serious about living your Life’s Purpose– Ask for your one breath and intend the surrender. With asking and with the intention, you will come to and ALWAYS find the answers- and eventually pop out the other side.